The condition, state or quality of being as free or as free as possible from all flaws or defects. This post has been on my mind since my trip to Omaha, about a month ago. Thoughts about what I wanted to write, what to share and how I would do it would occupy my thoughts. With most posts or ideas- I jot down random thoughts and then compose a rough draft on paper. Then I type it and make edits and clean it up. This post was much different. There was no jotting down thoughts or ideas- it was almost like I had writer's block. But the more I thought about it- the more I realized that what was blocking me from writing- was myself, or rather fear. Because once I put pen to paper, or fingers to keyboard- these thoughts, they're out there, out in the open. Which means it's no longer safe, or protected within me. And that terrifies me. I've shared glimpses of it here and here but intentionally didn't go into detail. I've never considered myself a perfectionist. Those who know me well- know that I can be super flighty- I lose my car keys, phone, ID- you name it- I've lost it. In the family, I'm known as the kid who lost her passport on her way out of the country. And my wedding ring? Yeaaa.. cringe. But as I've gotten older, I've realized tendencies to maintain or strive for perfectionism have come out in different ways. It's easy to laugh or shrug off the 1,000th time I've lost my keys or phone but less hard to shrug off that I don't always have it all figured out, that my kids misbehave, that my child qualifies for an IEP, that my house gets messy and my professional life was in question for almost a year. I work hard to make my life near perfect- whether it's preparing for a birthday party and ensuring EVERY LITTLE DETAIL IS JUST SO. Or, getting ready and making sure my outfit, hair and make up is perfect. Or, making sure the girls' outfits match their bows. I turn into a crazy, mad woman when we have guests- dusting, redusting, and making things JUST SO. WHY DO I CARE SO MUCH??? I know no one is perfect. I know my kids, my friends, family don't give ONE RIP if the girls' outfits match or that our mini blinds aren't clean. BUT I DO. And it's because I'm scared out of my mind to let those things go. 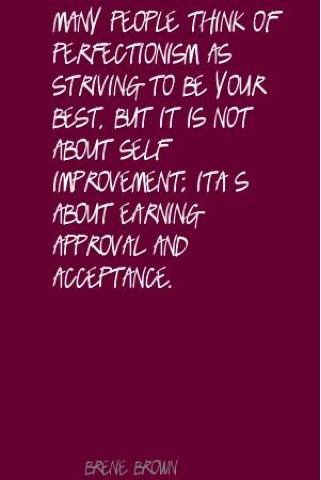 I hold myself to a higher set of standards than I hold anyone else to. I'm SUPPOSED to have a clean house. I'm SUPPOSED to be put together. My kids are SUPPOSED to look perfectly dressed. I'm SUPPOSED to make home made meals, use non toxic household cleaners/products. I'm SUPPOSED to have IT ALL TOGETHER. Then, that means I am somehow less of a person. And that is unacceptable. As a helper- I SHOULD have things figured out, my LIFE CAN'T BE A MESS. But reality is, sometimes it is. I HAVE to learn to let go. BREATHE. To know it's all gonna be ok. That the people who matter the most, don't care what I look like, what my house looks like, or what I serve for food. 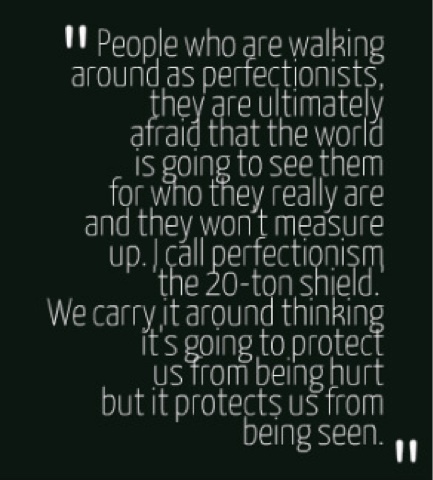 I've also realized my strive for perfectionism is there to not let people in. Because if it all looks good on the outside, rarely do people question if it's all good on the inside. People think, "Wow- she must have it all together." And that's a safe place for me to be in- to not be asked if everything is ok, if I'm ok. Also, would people accept me if they saw the real me? Imperfections and all?